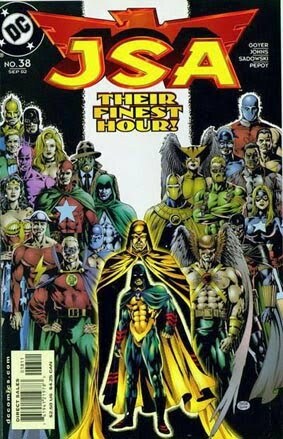 • JSA #38 "Father's Day"
• PLOT SUMMARY: The new Hourman, Rick Tyler, journeys to an inter-dimensional timefield to confront his dead father about Rex's life as the original Hourman, and learn the motivation of a failed family man. Meanwhile, Jakeem, with the help of the Thunderbolt, learns of a life he almost had. After discovering his father through a wish, he must now gather together the scattered pieces of his life to somehow find direction.